Acne Scarring – SkinPen is the answer! Omaha’s Choice for Non-Surgical Aesthetics – Now Serving You in TWO locations! Call (402) 614-5556 today for a FREE consultation! Looking for a procedure that is safe, minimally invasive, and helps the appearance of fine lines and wrinkles? 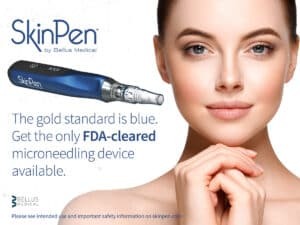 SkinPen Precision could be the right choice for you. You will be amazed at the results SkinPen can achieve! SkinPen microneedling is minimally invasive, and a quick procedure, performed in our med spa. Procedure results are generated from your skin’s natural collagen remodeling and elastin. Recovery time is short, making SkinPen ideal for a busy lifestyle, and a great place to start for aesthetic procedures. SkinPen may be used on all skin types, and is ideal for assisting in reducing the signs of aging. A versatile, precise device for use on the face, neck, back of the hands and upper chest (decolletage). 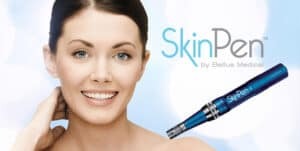 SkinPen is medical micro-needling, used to stimulate collagen and elastin, remodel acne scars, treat hyperpigmentation and improve the appearance of the skin. 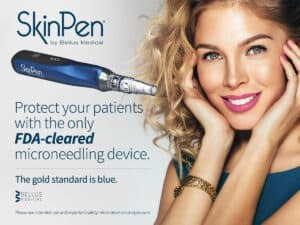 SkinPen Precision is the current device that is used at Omaha Med Spa. 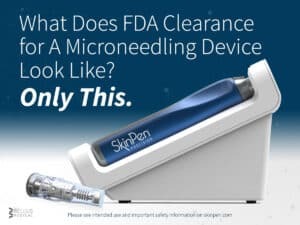 This is the third generation SkinPen that was reviewed by the FDA in 2017 and is the first time a micro-needling device has received official approval for use in micro-needling. 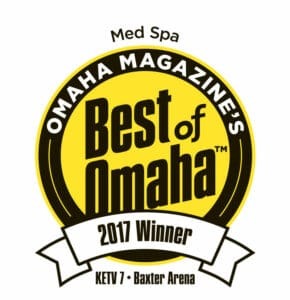 When you come to Omaha Med Spa, you can rest assured that you are receiving treatment using the newest and safest technology on the market today. Because we use the best equipment available today, the cost of your treatments may be a bit more compared to other med spas that use foreign made devices and treatment cartridges that cannot be trusted. Your health and safety are Dr. Abbott’s number one concern. Micro-needling uses very fine needles that puncture the skin hundreds of times a minute, creating thousands of micro-channels in the skin. This controlled injury stimulates the production of new healthy collagen and elastin. The procedure is performed with use of numbing creams that we apply for 10 minutes at the start of your visit, so discomfort is minimal. After treatment the skin appears sunburned but this appearance disappears quickly over the next 1-3 days. If any bruising occurs, it is pinpoint in size, easily concealed, and resolves quickly. Slight tingling and burning of the skin may last for several hours. With your first SkinPen treatment you may experience mild exfoliation (light peeling). Your “downtime” is short and your benefits are great. When you complete additional SkinPen treatments, the recovery time from redness is even shorter, as the health of your skin improves! Micro-needling is performed at our west Omaha Eagle Run location office by our Aesthetic Nurse Jen. SkinPen is also now available in the Omaha Old Market office and treatments are provided by Sonia Sublett-Adams APRN. Pictured below is the improvement that can be seen in the appearance of acne scarring after 6 treatments using SkinPen Precision. “Before treatment” is pictured on the left, “After” several SkinPen treatments is shown on the right. The goal of treatment is to improve the appearance of acne scars by approximately 50% after up to six treatments. As with all aesthetic treatments, individual results will vary. “Home Care” are instructions that we provide for you to follow afterwards. It is very important that you apply the correct skin care products to your face, to nourish the skin and stimulate maximal production of collagen and elastin. At the end of your treatment in the med spa, a serum rich in peptides (long chain proteins) is applied to the skin. We call it Peptide Booster since it will boost your production of healthy new collagen. 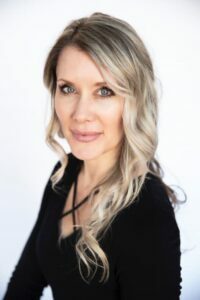 During the first couple of days after treatment, your skin is hyper-permeable, meaning that it is receptive to absorbing topical serums that are believed to support collagen and elastin production. Peptide Booster will be applied at least 3 times a days for the first two days after SkinPen, and then twice a day for the next four weeks. Two days after each SkinPen Precision treatment you will be instructed to also start applying Vitamin C & E Serum which is rich in the anti-oxidants Vitamin C, Vitamin E and EGCG (the anti-oxidant found in green tea). Vitamin C is a co-factor that is needed for the skin to produce collagen, so it’s use after micro-needling is critical for the success of the procedure. Both Peptide Booster and Vitamin C&E Serum are private labelled premium products available directly from Dr. Abbott at Omaha Med Spa and sell for $80 each. One week after each treatment, you will add in another key skin care product offered only by Dr. Abbott called Retinol Silk. This is a medical grade Retinol, not to be compared to weaker versions available over the counter. Retinol Silk stimulates even more production of collagen and continues to fight against the recurrence of new brown pigmented spots. This is a product to be used at night for the rest of your life. Retinol Silk sells for $95, and comes in a convenient twist and pump dispensing system. 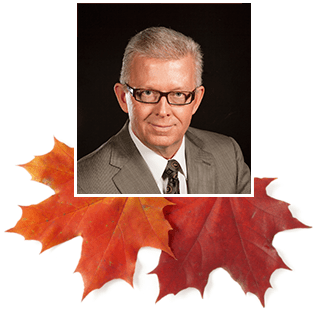 All of the privately labelled skin care selected and sold by Dr. Abbott may be purchased over the phone and shipped to your home. Plan on receiving three to six treatments of SkinPen spaced at least 4 weeks apart. After you complete your series of 3-6 treatments. After you successfully complete a series of treatments, you can maintain the benefits of SkinPen by repeating single treatments to the same area every six months. Determine the areas you want treated. The most common treatment is face. If you are interested in treating the neck, upper chest, back of the hands, or other body area, please consult with Dr. Abbott for pricing. Home Care products using Vitamin C&E Serum and Peptide Booster cost $80 per bottle and Retinol Silk $95. Treatment pricing includes the use of numbing cream, sterile saline is applied to the skin, application of Peptide Booster and sterile disposable treatment cartridge. SkinPen is a more affordable option than laser resurfacing or dermabrasion, which may cost several thousand dollars. With SkinPen you can return to work the next day. Laser resurfacing or Dermabrasion can lead to you missing work for 2-3 weeks!